Beautiful Territorial Warrant from the Territory of Montana issued in 1886. 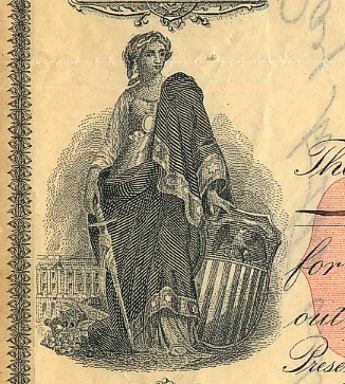 This historic document was printed by Pioneer Press Company and has an ornate border around it with a vignette of Lady Liberty. This item has the signatures of the Territorial Auditor, J. P. Woolman and Treasurer, Daniel H. Weston and is over 123 years old. Montana's government began under the United States government's territorial system in the mid-nineteenth century. On May 26, 1864, President Abraham Lincoln signed the bill creating the Territory of Montana from the eastern portion of Idaho Territory. Gold discoveries in the areas around Grasshopper Creek (Bannack) and Alder Gulch (Virginia City) prompted this new territory. Settlers in the mining boomtowns and elsewhere in the mountainous areas near the Clark Fork of the Columbia River sought easier access to their government. The geography of the area dictated that transportation was relatively easier east of the Bitterroot Mountains, naturally tying together the settlements along the Clark Fork River and the mining towns just east of the Continental Divide. Thus, through geographic necessity and some political maneuvering, Montana�s boundaries were set, wedding the vast open expanses of the Upper Missouri River system on the east with the Clark Fork of the Columbia and the adjacent Flathead and Bitterroot valleys on the west. This turn of fate would play a substantial role in shaping the future of Montana and its government, providing a more diverse resource base upon which to build a successful state. Joseph P. Woolman was Territorial Auditor Feb. 22, 1879 - Mar. 4, 1887. Daniel H. Weston was Treasurer from July 1, 1875 - Mar. 5, 1887.